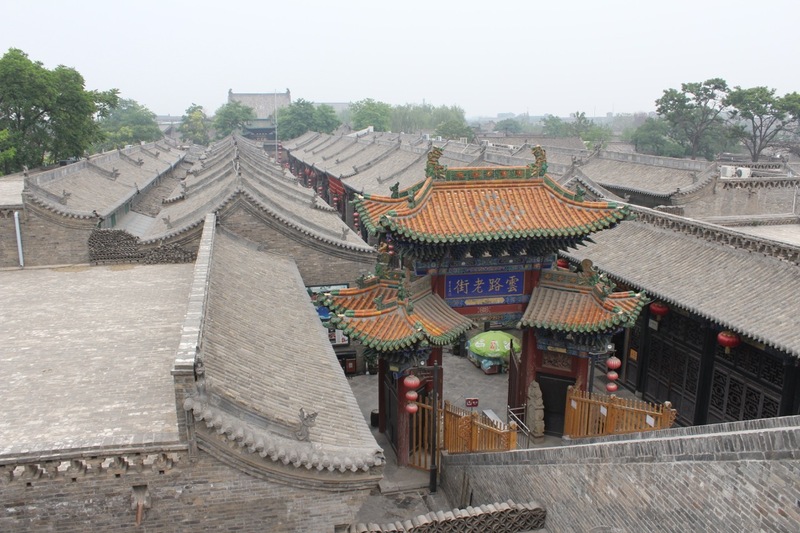 We are now in Pingtao, located about 400 miles southwest of Beijing and the oldest and best preserved walled town in China, with a history dating back some 2,700 years and buildings dating back to the 900s. It is a miracle the Red Guard did not destroy this town in the 1960s when they were destroying everything else of antiquity that they could get their hands on. In fact we were told that had not Chou ordered the army to protect the Forbidden City, Temple of Heaven and other Chinese treasures, they would have destroyed them as well. But Pingtao was located in a forgotten, out-of-the-way place, and nobody thought much about it. In the 1980s when tourism was getting started again, somebody got the idea this might be a tourist destination. Bingo! 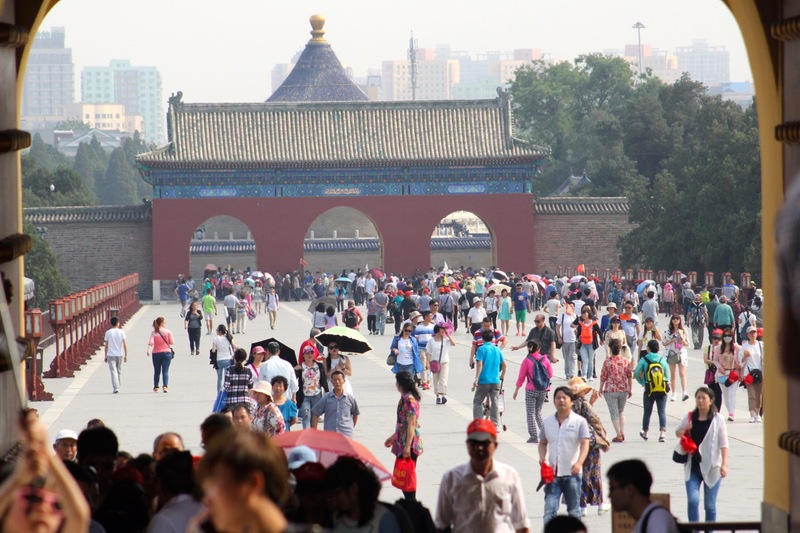 Today it is one of the most popular tourist attractions in China, a World Heritage site and a well deserved one. The trip from Beijing to Taiyuan was uneventful with our train arriving on time as has every single train we have taken during the entire trip. 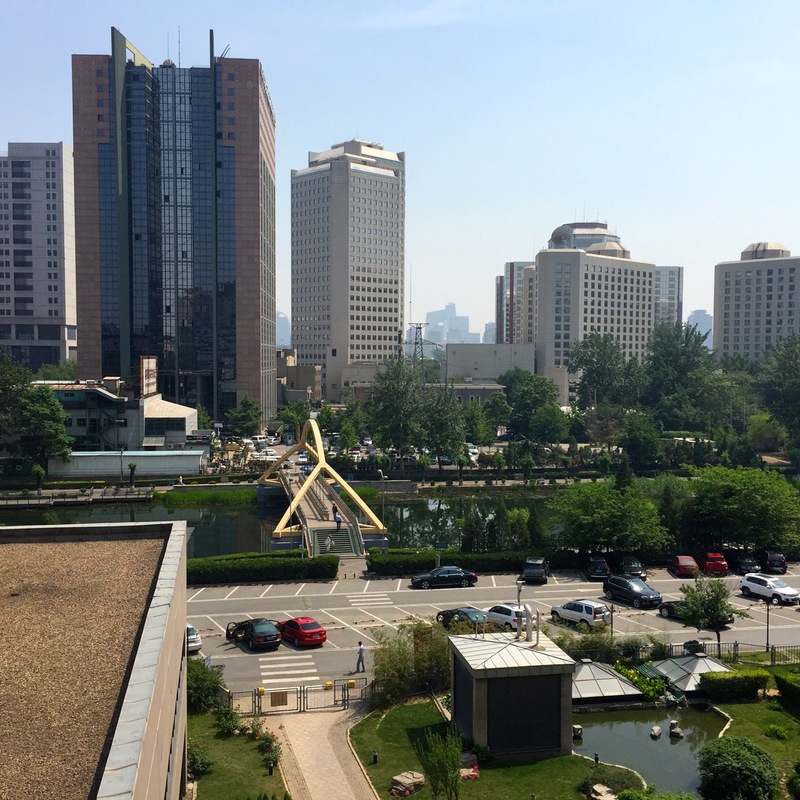 A city of over 3.5 million, Taiyuan is a center for manufacturing and mining and not a tourist attraction. We were met by Jenny, our guide for the next two days, who suggested we get out of this bustling, somewhat raw town as quickly as possible. After a quick lunch, we began the two hour-long drive to Pingtao. This was the first time we had been on Chinese highways. Our driver was excellent as was the driver in Beijing, but driving in China is not the same as driving in the US. At one point, I commented to Embry that this was the most terrifying ride I had ever been on, and then she reminded me that India was far worse because there in addition to wild and crazy drivers you also had sheep, cows, camels and even elephants to watch out for. Here it was mainly other drivers and huge 26-wheel, behemoth trucks. Drivers in China also seem to drive with their horn as much as their steering wheels. The rule of the road here, as in India, seems to be that the big guy wins, so you can be as aggressive as you want with approaching smaller cars, but you do not mess with the behemoths. I was certain several times that a head on collision was unavoidable. The main issue has to do with the way the roads are designed. There are two fairly wide lanes and a shoulder, and for the most part the roads are new and in good condition. The problem is that the two-lane roads are wide enough so that there is actually room to pass in a non existent middle lane—barely enough. Of course, the roads are jammed with traffic, even in somewhat remote locations like the road between Taiyuan and Pingtao, and everybody passes all the time using the non existent, middle lane. This usually works out ok since the roads are wide enough to squeeze between the car or truck you are passing and the one coming at you from the opposite direction, but not if someone else coming from the other direction decides to pass at the same time. This is when the Big Guy Rule takes effect, so if the vehicle coming from the other direction is bigger—or God forbid, a 26 wheeler—you dodge back into an opening if one is available. Actually this is a lot like sailboat racing as boats vie for position when rounding the weather mark. While there is no “starboard right-of-way” or “room at the mark” rule, the slower cars seem to understand, slow down and give you a space to dodge into. If they don’t, it is curtains. But it is curtains for them too, so the other drivers oblige and make room. As for me, after awhile of watching this, I just tighten my seat belt, hold my breath, and put my hands over my eyes every time it is our turn to pass in the middle lane. We made two stops along the way—one, a well preserved, walled village which in the 19th Century belonged to an extended wealthy family and the other a Buddhist temple dating back to the 900s. Getting to the Buddhist temple turned out to be a challenge since an elderly lady was positioned in the middle of the dusty road with her bike blocking our lane and several tin wash bowls laid out across the other lane. Cars were lined up patiently waiting in the other lane, but our lane was clear except for the bicycle. Both our guide and driver got out and walked over to the old lady where they both gestured consternation and disgust. A few minutes later they returned to report apologetically that she would not budge. Apparently her son had been injured by an automobile, lost a leg, and she was demanding reparations from all who passed by. It would have been very easy simply to pick up her bike and move it out of the way, but our driver and guide honored her wishes, and we drove on to find another way to get to the Buddhist temple. Since she was not asking for much, only a few yuan, I wondered why our guide did not just give her the money. By late afternoon we reached Pingao, where we drove through heavy traffic and countless gas stations, mechanic shops and junk yards to reach the gate into the old city. There we abandoned the car–no cars allowed inside the walls–and boarded a golf cart, which took us, our guide and baggage down narrow streets and eventually to our hotel. The side streets were mostly empty, but the major streets with all the shops were jammed with people. I am writing this post from the dining room of “Jing’s Residence,” which is a 15 room converted private mansion (along with other previous uses such as a photography studio and small factory) several hundred years old. 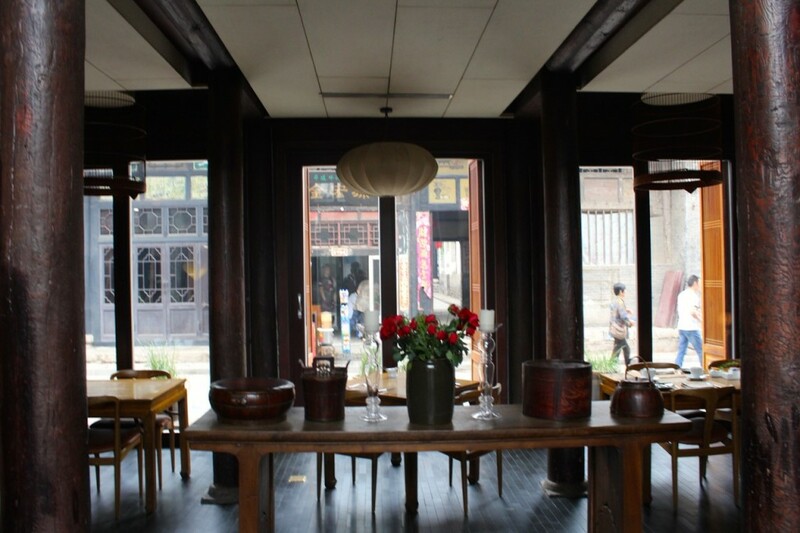 Madam Jing, a wealthy business woman, purchased the abandoned building several years ago and over four years restored it to a world class boutique hotel with exquisite wood carvings and Chinese wall hangings and artifacts. It is a true gem and the nicest hotel yet. The only puzzling thing is that the first night we were the only guests, and last night there was only one other guest, a couple from Singapore. That has not kept us from enjoying the excellent food and service, however, or our comfortable and beautiful room. But what really makes this special is that as I sit here and type out a blog post in the dining room, I get to watch the world pass by—people on bikes, some walking, many families with their one child in tow, some older folks with canes, some school groups—almost all Asian, mainly, I suppose, Chinese. I look at them. They look at me. I occasionally take a photo of them. The tourists—the ones with the Canon cameras, probably from Korea or Japan or Beijing– occasionally take a photo of me. Directly across the street is a mom-and-pop street vendor selling soup, bottled water and other street food, and every now and then people stop there, though they seem to be mainly locals and not tourists, and some just hang out. The mother is there during the day. The father returns from work somewhere else late in the day, and we watch them and their teenage son enjoy dinner each evening as they watch us enjoy ours. Actually we are not really sure how many people live there because all sorts of people of all ages come and go all day. Next door to them is a small shop where an old man sits out front most of the time, and we are not sure what, if anything, he is selling, and next to him is a very modest residence where a mother and teenage daughter spend most of their time sitting on their front steps and like me, watch the world go by. I could sit here all day and not get bored. So that is life in Pingtao. We did get a full walking tour of the city yesterday with our excellent guide, a very sharp young woman in her early thirties, and saw much but by no means all of the city. It is actually pretty big. The wall is square with each side being about a mile long, and there are well over a thousand ancient homes—all built along narrow, cobblestoned streets and all with courtyards and tile roofs. On any given day we are told there are over 500 vendors and tourists numbering well into the many thousands. Embry is out today on a bike exploring the parts of the city we did not see yesterday. I am taking it easy, still trying to recover from the Meltdown and enjoying watching the world go by. I thought you might be interested in some additional information on a very unique aspect of Chinese public policy, the One Child Policy, which Joe mentioned in his blog post today. This is something that has interested me for a long time, having started my career as a demographer and reproductive health researcher. As China entered the 1950s, with many adult men having been killed in the war, the initial Communist Party policy was to encourage large families. (My recollection is that in the 1960s average fertility rates were high in China, as in many other parts of Asia, with family sizes averaging 5-6 children.) At some point, however, with the population of China rising very rapidly and poverty increasing, a complete turnaround in policy occurred. There are also penalties, including most importantly the loss of a government job if you have a second child. Government employment is still considered to be the most desirable kind of job in China, in spite of the large private economy. One young person we met mentioned having a younger sibling; when we asked how that happened, she said that her parents did not work for the government, so they felt comfortable having another child since no one lost their job. In addition, local governments have population growth quotas and local “family” (a somewhat ironic term, since families do not determine their own family size) planning bureaus for enforcement. They may impose fines on families for having a second (or subsequent) child. This has led to resentment against the policy. 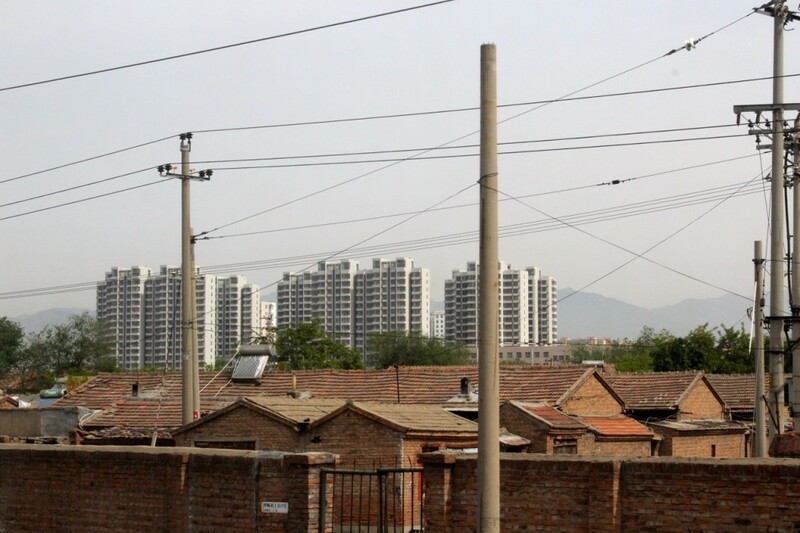 The “long arm of the State” thus reaches into the homes of most Chinese families in ways that would not be tolerated in most other places in the world. Apparently another social norm that has been established is an acceptance of abortion as a routine and acceptable form of “family” planning. I read a rather chilling article in the Global Times—a free English paper passed out in hotels (and illustrating that some free press does exist in China)—about one jurisdiction that did not meet it’s “abortion quota.” That jurisdiction came under pressure from the central government for having a high birth rate, so it established an abortion quota on its local jurisdiction family planning bureaus. The assumption was that in order to keep the population in check, it was necessary to have a certain number of abortions, and if they did not they just were not doing their job. Pregnant women who already had a child were pressured by the government agency to have an abortion, leading to protests and the newspaper’s coverage. The idea of the government pressuring me to have an abortion really gives me the creeps. As a typical female Democrat, I am solidly “pro choice,” but this is quite a different twist on the pro-choice issue than the one we have at home. On the other hand, we have witnessed what is an apparently positive result of this very onerous government policy. 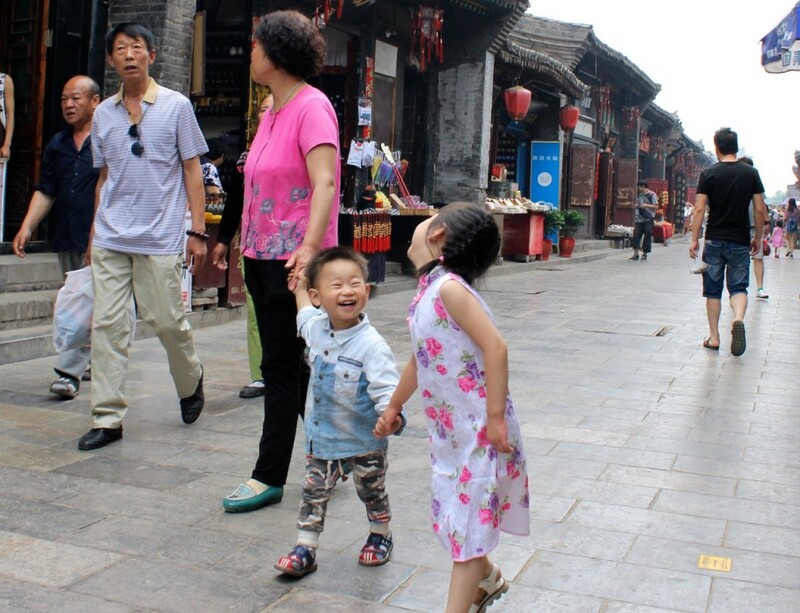 Everywhere in China you observe well-nourished, happy children. Each family has only one (it is very rare to see a family with two children, and perhaps those are often tourists from other parts of Asia), but that child always looks happy and often is surrounded by two loving parents and frequently grandparents. All adult family members obviously cherish the cute little one. In 2010 the One Child Policy was modified to allow couples who are both only children to have two children. Last year it was further modified to allow couples, only one of whom was an only child, to have two. Part of the reason for changing the policy is widespread dissatisfaction with the policy (due to some of the factors described above), but perhaps a more important reason is the distortions that the policy has created in the population demographics of China. First, there are more men than women. More importantly, when the cohort of parents of all these only children (people born between 1950 and 1980 or so) reaches old age they will have fewer young people to contribute to their pensions and look after them in old age. Just as with the top-down housing policies Joe discussed in an earlier blog, it appears that top-down family planning policies can lead to unintended consequences. There are many happy children in China now, but they will have many difficult responsibilities for their parents when they become adults. At that point the massive social experiment known as the One Child Policy will likely be a thing of the past. We are on the bullet train to Taiyuan, a town about 350 miles southwest of Beijing. The 20-car train left exactly on time, and averaging about 185 mph, it is even smoother and fancier than the European high speed trains. Only twenty minutes after departing Beijing, we are in farm country with cultivated fields taking up every available inch of space, a large number of which are tree farms. The only problem is that it is hard to see the countryside because of the dense smog, which was present when we left Beijing, and after almost 100 miles is still so thick that visibility is limited to several hundred yards. 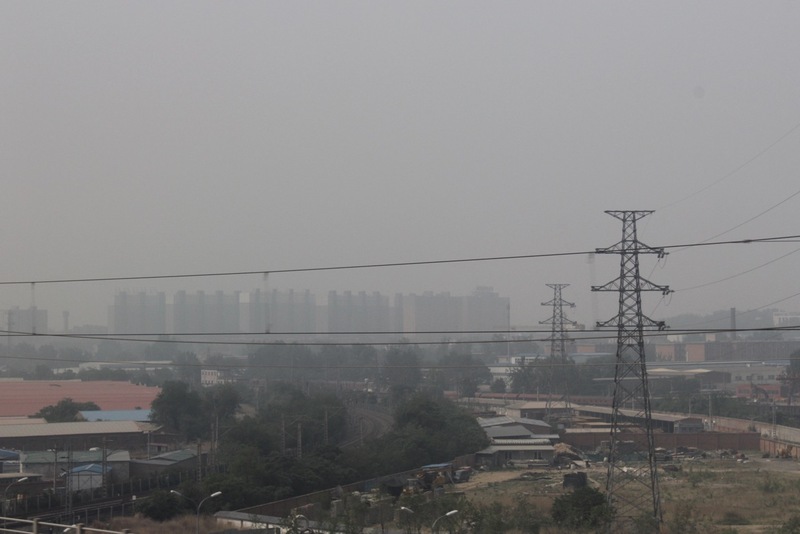 While during our week in Beijing we experienced generally poor air quality, this day is by far the worst. But what a week in Beijing it was! Despite temperatures near 100 degrees and my health problems ( I am continuing to slowly get my strength back), I was able to enjoy the experience. The second hotel we stayed in—the Red Garden Inn—was the best yet, a true gem of peace and serenity in the middle of one of the world’s busiest cities. We enjoyed a farewell meal last evening with Pat and Chris (the couple on the tour who live in Ireland) in the peaceful courtyard of the inn. Our guide, Ben, was also terrific—well organized, smart, knowledgeable and flexible, a true master guide in every respect. Ben(not his real name, of course, and it seems all the Chinese English speaking guides have Anglicized nick names) is 62. From age 17-25, when the Cultural Revolution was in full swing, he was ordered by the government to work on a farm in Inner Mongolia. During this time colleges were closed so he missed that opportunity along with almost everyone else in his generation. He learned English on his own (and speaks extremely well), attended tour guide school in the late 1970s when China was starting to promote tourism and has been a guide ever since. 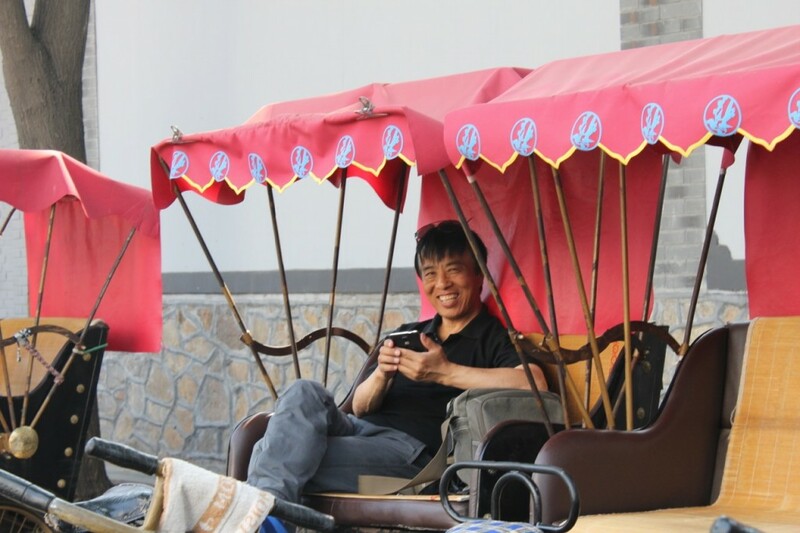 His daughter recently earned a masters degree from Cornell and is living and working in New York City, and he has led several Chinese tourist groups to the US. Not one hint of remorse or sour grapes from him or for that matter any negative comments about the government. In fact despite what he experienced as a young man, he remains a fan of Mao. I have to say that the China we have experienced so far is as clouded in mystery as the landscape we are racing through is clouded in smog. The construction that has taken place over the past 30 years has got to be a world record. Though there are some older areas like the Hutong District with tiny houses and narrow streets (now protected as a historic district, by the way) and we are told that some neighborhoods reflect extreme poverty (none that we have seen), what stands out is the newness of everything and the often stunning and generally tasteful architecture. But that is just the beginning: Trains are the best in the world. Unemployment is low and a huge middle class has been created. People seem to be happy, work hard, and always on the move. We have not seen one panhandler or any evidence of homelessness. Food is plentiful and delicious, restaurants crowded. Prices to us appear reasonable. And most miraculous of all: we have not seen one word of graffiti. Anywhere. Traffic and air pollution and overbuilding are big problems, but the Chinese are working on them. Many are fearful that economic disparities are eroding some of the gains made between 1980 and 2000 and the social safety net is eroding further, but despite this, on one level at least, we are witnessing one of the most spectacular turnarounds in world history. On the other hand, though China is Communist in name only, it remains a totalitarian state. Freedom of speech is limited. There is no free press. Facebook, Google, Twitter, and Wikipedia are not accessible on the internet. You can’t get the New York Times on line. There are certain aspects of personal behavior, like the one child policy, which profoundly impact individuals. People whisper about cronyism and how high level officials get all the good deals. No one, however, criticizes the government very loud. So one question is why the iron fist. Thousands of Chinese study in US colleges every year. Thousands more Chinese now tour the US. It is not that Chinese people have no exposure to the West. What are the Chinese leaders afraid of when they are sitting on a huge success story. Why not allow for more personal freedoms? I have asked this politically incorrect question to our various guides and have not gotten an answer. People do not go there. One possible partial answer might be found in China’s 4,000 plus year history where centuries of empires and dynasties and tight government control have alternated with periods of decline, civil war and chaos. It could happen again. This is a country of almost 1.4 billion people, about sixty different ethnic groups, over 250 different dialects (but only one written language). Having experienced total chaos in the first half of the last century (and also during the Cultural Revolution), China is now in a period of stability and tight government control. It is producing wealth and has improved the lives of hundreds of millions of its citizens. Given their history of control or chaos, you can see how they could view the options as either/or. Providing more individual freedom could be viewed as a Pandora’s box. You open it up, and you don’t know what you will get. No one wants chaos. Their thinking may be that maintaining order with an iron fist is the price you have to pay. Who knows? We still have almost three more weeks here. Perhaps the smog and mysterious clouds will thin out and we will begin to understand better what this extraordinary country is all about. Body slam. The stress and rigor of the adventure finally caught up with me. I have loved, if not every minute, most every minute. My body has not. Body wins. “Level II Meltdown”. Time out. 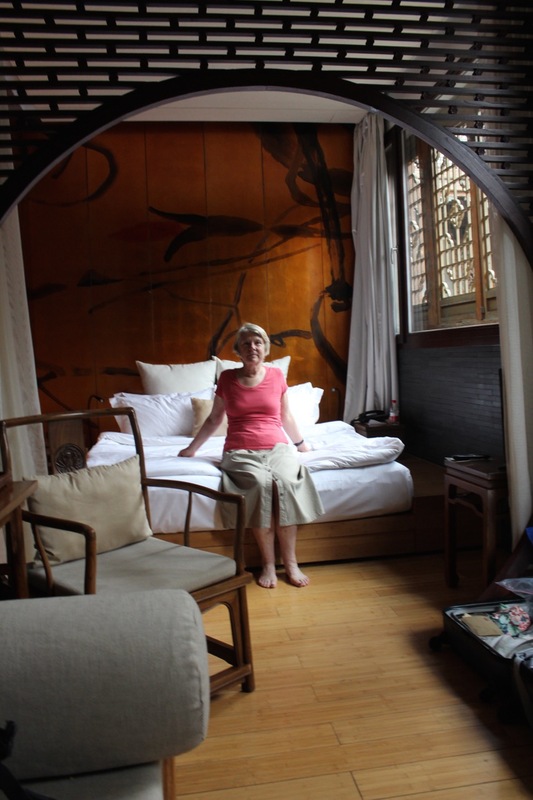 So I am writing this blog on Tuesday from my bed in our quaint, boutique hotel in the old section of Beijing, the hutong or alley district. My collapse happened on Saturday. The first two days in Beijing we were with the group in a five star business and tourist hotel, which was luxurious and elegant, but this 15 or 20 unit, ancient former residence is really special. 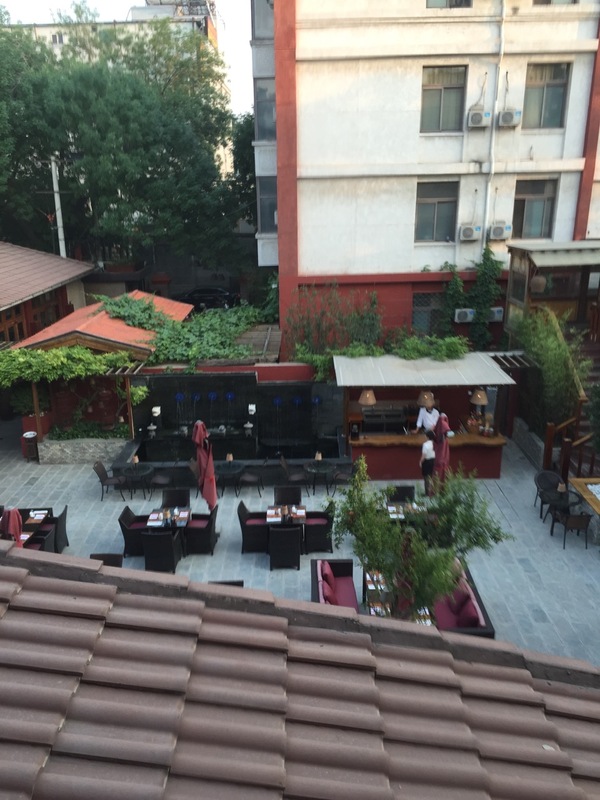 Only three stories high it is tucked away on a quite alley and has a peaceful courtyard with an elaborate fountain and plenty of shaded tables used for outdoor dining—and the food is the best we have had in China. If you are going to get nailed and need a place to recuperate for a few days, this is it. Embry has brought you up to date on many of the activities which unfortunately I have missed though on Saturday evening I did make a heroic effort and joined our group for a goodbye dinner of Peking duck and farewell toasts and speeches. I also went with the group for a tour on Friday of the Temple of Heaven, which frankly was the straw that broke the camel’s back, and now that Embry and I are on our own (which started Sunday) have visited with her and our private guide the largest Buddhist temple and monastery in China and a Temple and University related somehow to Confucius. Last night I managed to pull myself out of bed to join Embry for the Chinese opera. So given the circumstances (total exhaustion and horrible cold-like symptoms), I am doing pretty well. 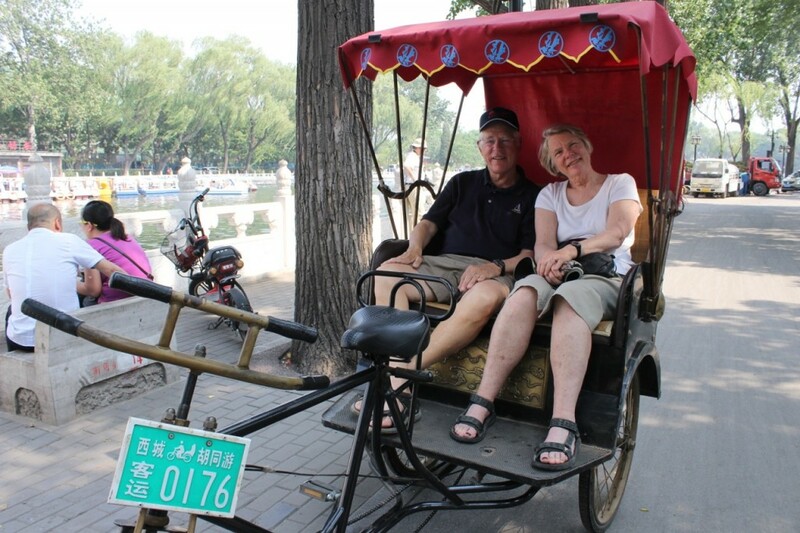 Today we went out for lunch and took a rickshaw ride through the hutong. No need to feel sorry for me. In fact you should be proud of me because I single-handedly was able to obtain the one last essential document we need in order to be able to board the container ship, which departs in less than three weeks: an official health form executed by a certified Chinese physician that you are in perfect health. Furthermore, we had only a small window of opportunity to do this since it cannot be dated more than a month before you leave or less than two weeks. It dawned on us that Sunday was the only day that we could accomplish this without major inconvenience since our schedule was pretty much booked for the rest of the time in Beijing and who knows what would be available in the tiny villages we would be headed to next (one of which has a population of 35 million, but you get the point). And as luck would have it, there was a health clinic next door to the hotel. There were two challenges: first finding a doctor that would agree to do the check up and second passing the exam. On Sunday I already had one foot in the grave. Any competent physician would take one look at me and order me to the hospital. This challenge would take all the ingenuity I could muster. The strategy was for me to go first and check out the situation. I used all my strength to stagger over to the adjacent building, located the clinic, and tried to pull myself together. As I approached the receptionist, I was tempted to throw my myself at her feet and plead for a cure, any cure—herbs, acupuncture, drugs—to get me past the Level II Meltdown. But, alas, that would mean no papers for the container ship. So I took a deep breath, told the nurse what I needed and showed her the form (which had stuff on it like, have you ever had tuberculosis). In fact I explained it to her about six times before she gave up, asked me to sit down in the waiting room where a dozen or so Chinese were patiently waiting in this sparkling, modern office, and said she would talk to the doctor. In less than five minutes she motioned for me to come forward. There was the doctor—a 30-something, serious looking man with a puzzled look on his face. Show time: I explained that my wife and I needed this stupid form filled out in order to cross the Pacific, that we were both in perfect health (that comment got a second look) and that all I needed was his signature at the bottom of the page for both forms. Then I produced two completed forms filled out by our Kaiser physician just before we left. Was this a brilliant idea or what? He looked over the Kaiser forms carefully, gave me another puzzled look, mumbled something like, ”Kaiser, know Kaiser,” shrugged his shoulders and then signed the forms—both of them. I wanted to hug him on the spot. I said “thank you” for as many times as I could before the nurse pointed me to the door, smiling. No charge, just best wishes for a nice trip. Now is China a great country or what? Or what? That will be the subject of subsequent blogs when I get my health back. We have now been in Beijing for three days, and Joe suggested I type in my notes from my diary about what we have seen so far in this vast, bustling city. So here you go. 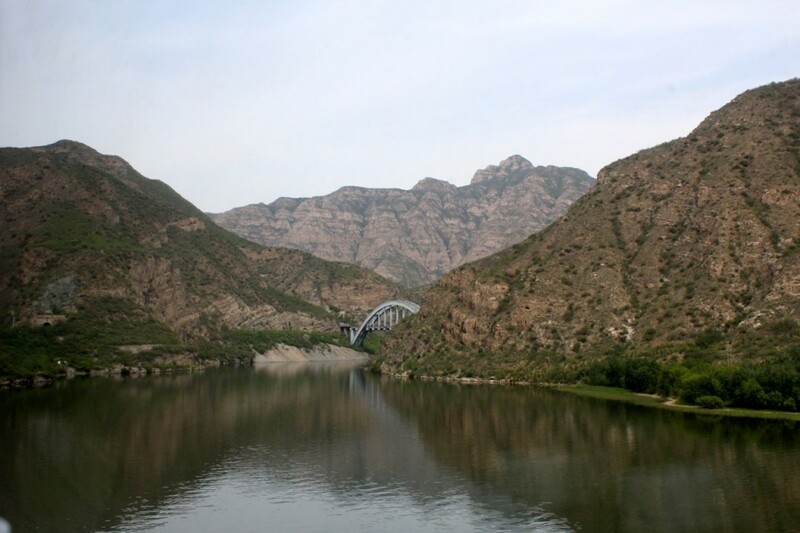 We enjoyed the beautiful scenery on the train from the Gobi Desert, which consisted of high mountains and valleys, just as you see in Chinese paintings through the ages. We arrived at the Beijing rail station about 10 am (dead tired from the 5 am wake-up in the Gobi). We met our local guide, and believe it or not we got on the bus and set off on a “forced march” to see the beautiful Temple of Heaven, the place of worship for China’s Ming (1368-1644) and Qing (1644-1911) Dynasty emperors. The site was number one on the list of top places to see in Beijing, given to us by our friends J.Vic and Judy from their recent trip to China. They described it as the “Taj Mahal and Angor Wat of China.” I agree that these ancient wooden buildings, continually painted and re-painted in bright colors, are stunning works of art. They were built beginning in the 15th century, and miraculously they were saved from fire and other forms of destruction throughout that long period, including during the Cultural Revolution. While most of China’s temples were taken down under the Communists, a lot of credit is now given to the efforts of Chou En Lai for using his influence with Mao to save some of the most important parts of China’s cultural heritage. 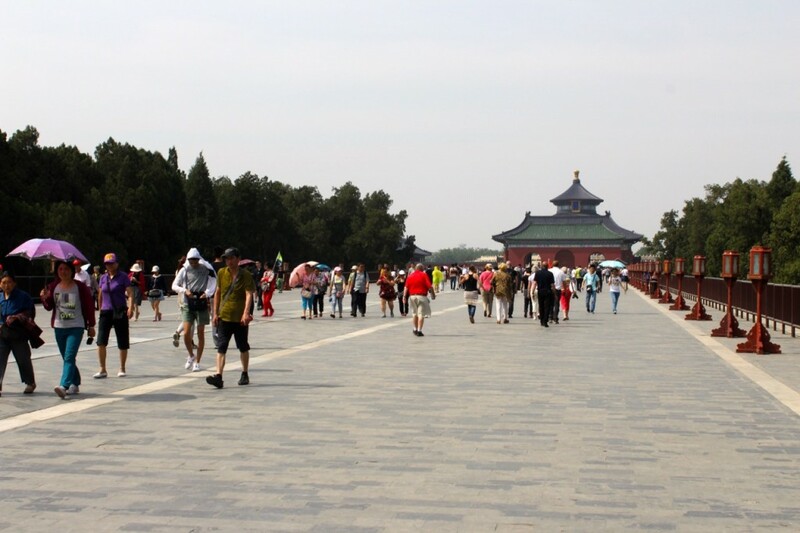 The Temple of Heaven was initially built beginning in 1420 by the third Ming emperor, Yongle, who usurped the throne and moved the capital to Beijing. (He also built the Forbidden City, described below). The Qing emperors maintained and rebuilt the Temple when they (the Manchus) conquered China (keeping the Ming designs and layout of the grounds). The emperors worshiped there with other officials, praying to “heaven” (not exactly the same as praying to a “God” but rather to the forces of nature and the ancestors who intervene) and offering sacrifices for good harvests, victories over enemies, and other important national needs. (This reminded me of the role of the Pharaoh in ancient Egypt.) The empress was allowed to worship with the emperor once a year, but no other women and only a few public officials were allowed in the Temple complex. One of the most beautiful buildings is called the “Circular Mound” (although it’s a building, not a mound), which is similar in design to round Chinese temples dating back thousands of years. In 1911 the “feudal system” (the PC term used here today for all imperial dynasties) was overthrown, and the Temple grounds were opened up to the public. It is now a UN-designated World Heritage Site. The section of the Great Wall that we visited is about an hour and a half out of town and is in a beautiful, remote location surrounded by high mountains and forests. I took a pretty strenuous climb up steep steps to see two of the watchtowers. The stunning views and fresh breezes were a welcome change from hot, noisy, polluted Beijing, where it has been hard to see the sky each day. The Great Wall was designed to keep out nomadic people invading China from the North (although it was ultimately unsuccessful). Still it is a mind-boggling construction project. It is a bit sad to contemplate that difficult labor; apparently at one time half the men in China were conscripted to work on it. On the other hand, it is almost a spiritual experience to walk up a passageway built so many centuries ago. It was built by the Ming Emperors but incorporated parts of the “long wall” started in the Qin Dynasty (around the time of Christ). One of the nice things about this site is that the tombs are approached by the Spirit Road, where the Emperor processed to visit his ancestors each year and down which he was taken when he died. (I suppose he had some interesting thoughts as he made that journey, knowing that possibly the next time he went he would be in a coffin!) The Road is lined with beautiful carved statues and a lovely park that was not crowded the day we visited. The statues have been miraculously preserved given their age and the turmoil that China has experienced over the centuries. These statues represent–in an important order of priority as you process down the road–various dignitaries (not actual people, but types of people). 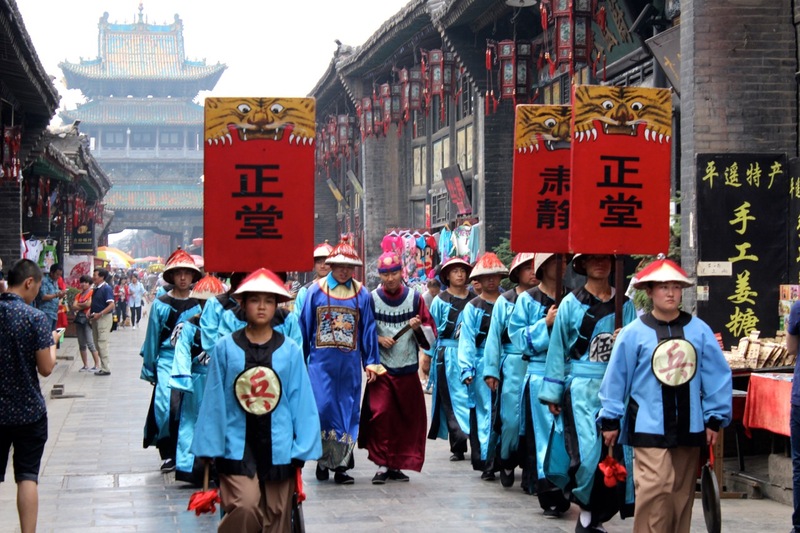 The most important are officials in the emperor’s court, selected for their performance on exams, according to the Confucian system, not because of their relationship to the Emperor. Next come the warriors, followed by interesting animals representing strength (lions) and other qualities of the Emperor. The next day we visited two very crowded places, Tiananmen Square and the adjacent Forbidden City. This was Saturday, and Chinese families seemed to make up most of the crowd. They were in family groups from babies to grandparents. (All but one family that I observed had just one child, and all the children were seemingly happy and beloved.) Many of the Chinese tourists and all the others were clustered in groups around umbrellas held up by guides trying to keep their stray ducks in order. While it is possible to go inside many of the buildings, they are largely empty of the huge collection of furniture, paintings, and documents accumulated over centuries. These were mostly hauled off by the Chinese nationalists when they fled to Taiwan, where they now apparently can be seen in a museum. (Not surprisingly, this is one of many points of conflict between the two countries.) Still the architectural details are so beautiful. I particularly like the carved marble balustrades, each of which has a beautiful carving of a dragon. I also like the ceramic processions of people, animals, and gargoyle-like monsters that grace the roofs of the pagodas. 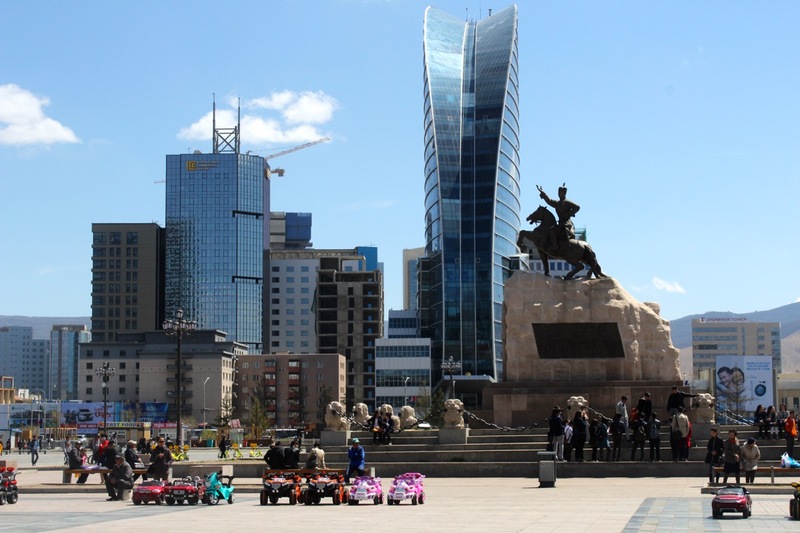 We cleared Mongolia customs and China passport control without much ado. Hans proudly announced that he had “worked out a deal” with the Mongolian army troops guarding the border to move all our luggage for us (which they did in style, goose stepping and saluting). I don’t know if Hans had to pay off anyone else and we did not ask. We said goodbye to our extraordinary guide, Katya, as we all lined up to give her a hug and wish her well for her marriage in August. Our guide for the next three days will be Chinese. 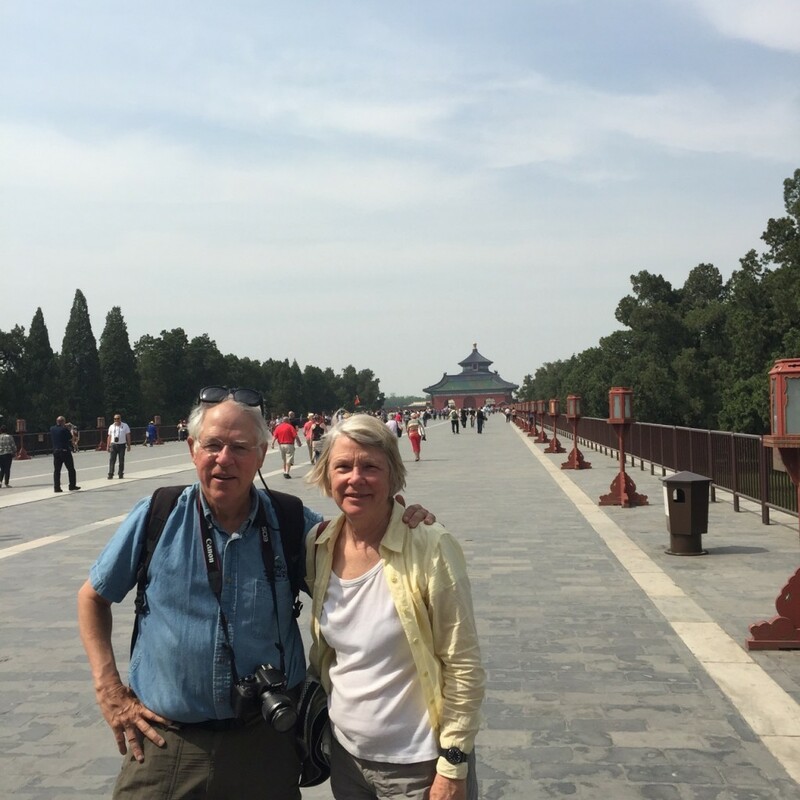 When we arrive in Beijing, Hans informed us we will have traveled almost 8,000 kilometers or almost 5,000 miles. Combine that with our journey to get to Moscow and my estimate is that we are close to the 10,000 mile mark. We are also just over half way in terms of time (day 69), so that makes sense. So on to China! We are going to be here for almost a month, so we will see and learn much. The first three days we will be with our Siberian tour group, which will visit the major tourist sights in Beijing. Then when the tour breaks up, we will be met by the first of several private guides in various cities, who will guide us along the itinerary we arranged through Asia Trans Pacific. The Chinese were eager to move on. We told them to build houses. They did. I was looking forward to seeing what they looked like. I was soon to find an answer. 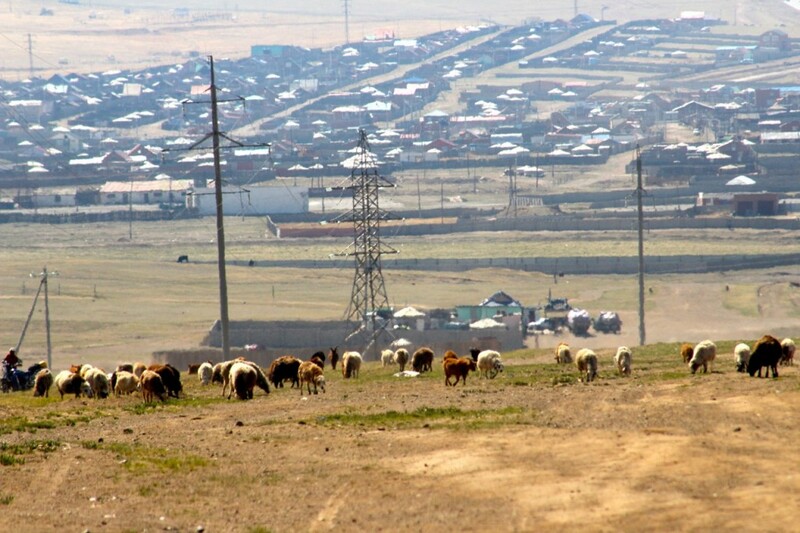 We found ourselves in the border town of Erlian when we emerged from passport control. Chinese buses transported us from the border to a hotel where we were greeted by our new Chinese guide, Lily, had lunch of countless, delicious Chinese food dishes, which just kept coming, and took a tour of Erlian, which included the new Dinosaur National Park (the site of numerous bone discoveries) and then the rest of the area. 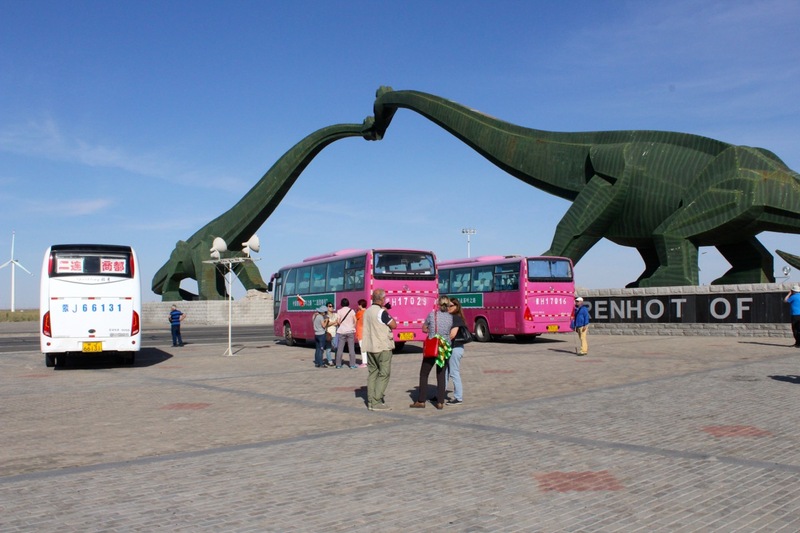 The dinosaur museum, which opened a few years ago, occupied several hundred acres at the edge of the Gobi desert and included three museum buildings displaying dinosaur bones and rocks. Several dozen bronze and metal replicas of various types of dinosaurs were placed in seemingly random spots in the desert surrounding the buildings. The overall quality of the exhibits and design of the buildings were quite good. However, except for a couple of local visitors (One, a father, asked if he could pose with us for his wife to take a photo. ), the 100 or so people in our group were the only people visiting the museum, making the experience a bit weird. After an hour and a half of wandering around among the dinosaur statues (which was about an hour more than we needed), we boarded the bus for a tour of the city, which was described as a very small town—about 120,000 people—without much of interest except the dinosaur park. Basically we were killing time until we could board the train headed for Beijing. It was only minutes before we were on a divided, four-lane main street, which went on for mile after mile. Side streets were also wide and most included wide sidewalks and separate paths for bikes, and these side streets extended at right angles from the main street almost as far as you could see. New trees had been planted along the roads. For the first few miles brand new, huge apartment complexes of 10-15 stories lined the main street and many of the side streets. Then you would drive for a block or two past vacant lots with only sand and scrub brush, and then on the next block would be more high rises, most of them very attractive. One building in the distance looked at lot like the famous opera building in Sydney, Australia. Many other structures were under construction. I stopped counting after awhile, but there had to be tens of thousands of units in hundreds of brand new buildings. Parks and plazas appeared every few blocks and then more open space with more statues of dinosaurs. A city planners dream, I thought, remembering the New Town Movement from my city planning school days in Chapel Hill. Toward the end where there was a huge overpass created by two huge dinosaur sculptures, we stopped to take photos. A large wind farm surrounded the sculptures with windmills stretching into the horizon. There was only one thing missing from all this: people. They were nowhere to be seen. We were in fact driving trough a modern day ghost town. No people, no cars, vacant storefronts. It could have been a movie set. Welcome to the New China! Whether this is representative of the New China or not is yet to be determined. When I asked Hans about it, he said that while there is a lot of overbuilding in China, eventually most of these new cities fill up, and it is a delicate balancing act to coordinate job creation with housing production. Thinking back again to my Chapel Hill days, I remember that in our own New Town Movement in the US in the 1960s, most federally insured new towns failed initially because of that same problem—not having the jobs to attract the people. While the development effort in Erlian appears out of sync with housing demand, Hans says there are many more examples of similar efforts that have created new towns with millions of people, all happening within one or two decades. The next day our train would pass by one of those “new towns,” and we would get a glimpse for ourselves. The evening following the tour included a stop at a surprisingly huge and bustling market (So despite the empty buildings, plenty of people must be living in the old part of Erlian.) and a “hot pot” dinner (Mongolian specialty) in a hotel in the old part of town. After dinner we boarded a commercial train to Beijing, which like every other train we have been on, departed exactly on time—this time at 9:16 pm. The train was very much like the Russian train, which had been our home for over a week and somewhat newer with elegant finishes to the compartments. Toilets—emptying directly onto the tracks—were at each end of our car, and we shared a wash room with Joyce, who was in the next compartment. We woke up very early the next day—around 5:30 am—and spent the time watching the scenery, which was as spectacular as you will ever see—towering jagged peaks, going straight up with a sparkling river winding through the valley below the train tracks. Small, ancient villages with dusty, dirt streets and crumbling walls and tile-roofed homes appeared from time to time; and when the valleys widened, we could see farmers with traditional round hats in the fields, bending down, planting and weeding. Along the way we also passed through several larger towns. One of these was Zhangiakou. What made this interesting was that the ancient, dusty villages lining the railroad tracks were just like the other villages we had passed except that right behind them were gigantic, modern 20-30 story apartment buildings, which extended for miles. 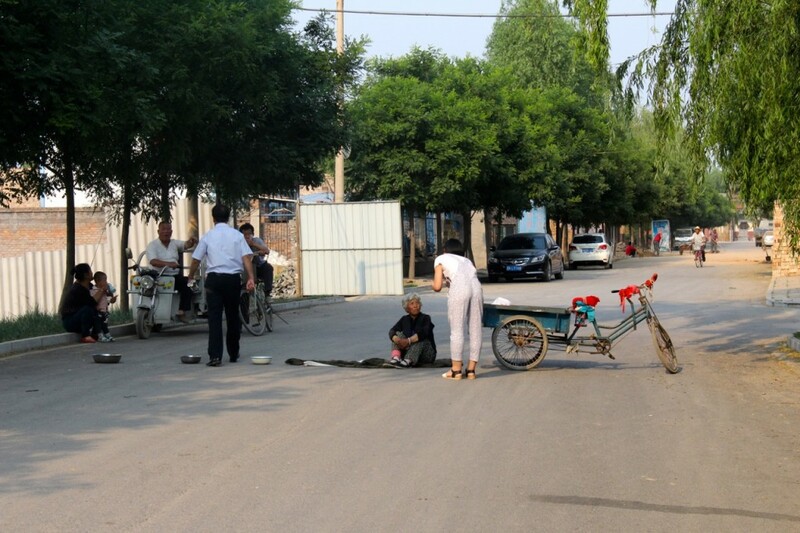 Unlike in Erlian, however, there was plenty of activity on the streets. Hans later told me the city had grown in the last 10 years from a few hundred thousand to over three million. Tower cranes everywhere indicated the growth was still going on. As our train got closer to Beijing, the mountains disappeared, and we soon found ourselves in the middle of a vast landscape of concrete and brick and marble buildings towering into the sky. Some were showing their age, but the vast majority appeared very new and for the most part very attractive. If I had been blindfolded and suddenly had it removed and asked where I was, I would have guessed maybe Las Vegas, Los Angeles, or perhaps Miami along Biscayne Bay. Who knows? Some glitzy, growing city on the make, flexing its muscle, strutting its stuff, with new, showy buildings, some gorgeous, some not, expensive shops for rich people to spend their money, fancy restaurants–exactly the kind of place that I would definitely not want to live in. And then I recalled the images of 1986, less than 30 years ago, of the drab, grey decaying buildings, the bike-filled streets and signs of poverty everywhere and wondered if this could possibly be the same place. Is this China? Are we really in Beijing? Or is it just a dream? We have about three more weeks to find out. When we were in Mongolia, we had the option to stay overnight in a “ger” (which is the Mongolian word for the more-commonly used term “yurt.”) Apparently in past years this early part of the season (the snow has only recently melted) has been “iffy” for ger-sleeping, due to extremely cold weather, so we were not encouraged to do this (in fact we were discouraged). However, when I read about this option long ago when we signed up for the trip, I knew immediately that it was something I wanted to do, since I love sleeping out in the wilderness, and being in the Mongolian wilderness sounded amazing. I was the only one of our group of 18 who chose to do it! We made our way with a driver through the awful traffic of Ulan Bator out of town and through the beautiful countryside of Mongolia. It is extremely arid, all brown now, with some green grass peeping through and some wildflowers. All sorts of animals graze in flocks with shepherds, usually on horses. 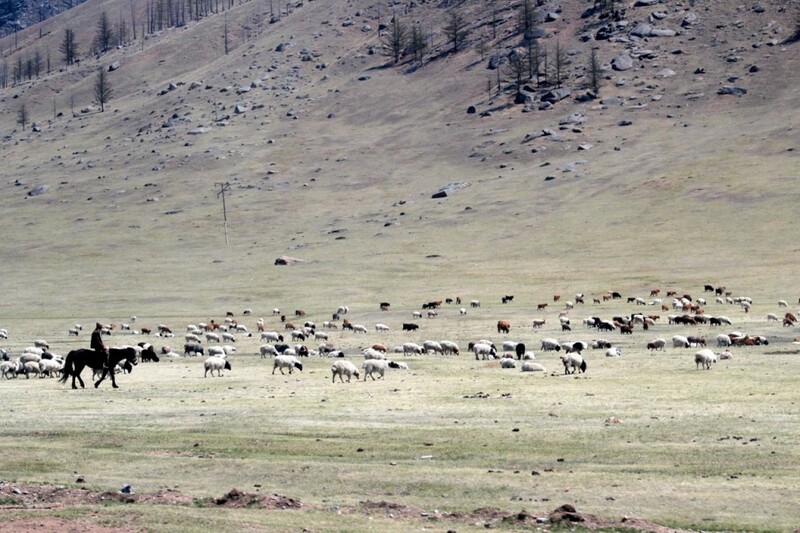 (In the course of the trip we have seen horses, cows, sheep, goats, yaks, and camels.) Regardless of the species, all the animals are short, stocky, and with plenty of shaggy hair. This allows them to survive the harsh Mongolian winters by grazing in the snow. For the winter they are often on their own, especially the cows and yaks, who seem to know how to wander for food and get back home. Now is the time of calving and foaling, and there are lots of newborns in the herds. All of these animals are milked, and there are a variety of specialized milk products from each type. For example, horse milk is fermented overnight and drunk the next day (and not made into cheese). Cow and goat milk is made into cheese, etc. When we reached the “ger camp,” we were in a beautiful, remote place which has been somewhat spoiled (but not much) by several of these camps, which have been developed for tourists (including Mongolians themselves from the city who like getting back to nature). Each camp has about 30 gers, as well a central facility with toilets and an eating hall. Ours was very nice. There were numerous staff, about 25, but It was confusing to me what their jobs were. Some were in the kitchen, some maintained the facilities, some stoked the fires in the gers, and some apparently are just sitting around waiting for more tourists to show up since it is very early in the season. The night I stayed only three gers were occupied, one for me, one for my guide, and one for an adventurous Swedish couple who are taking the “regular” Trans-Siberian to Beijing and just got off and Ulan Bator for a ger stay. 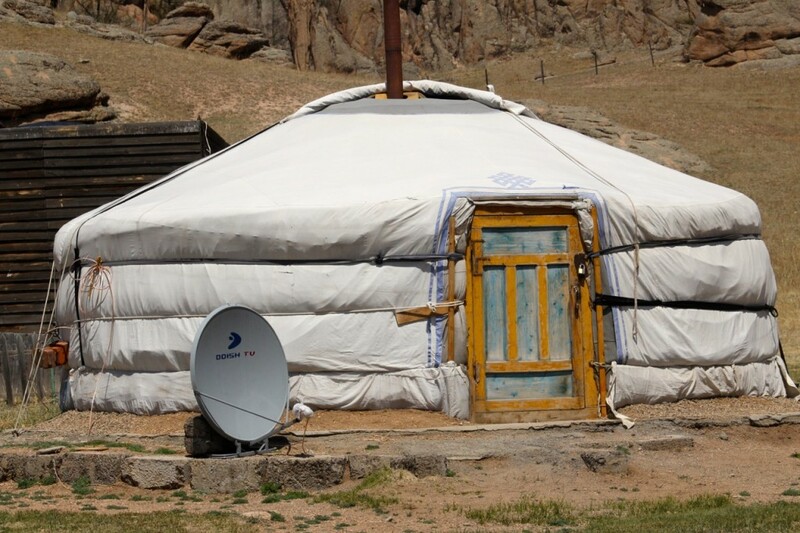 A ger is a round Mongolian house made of fabric (canvas, I think) that is a rather standard size, regardless of family size. 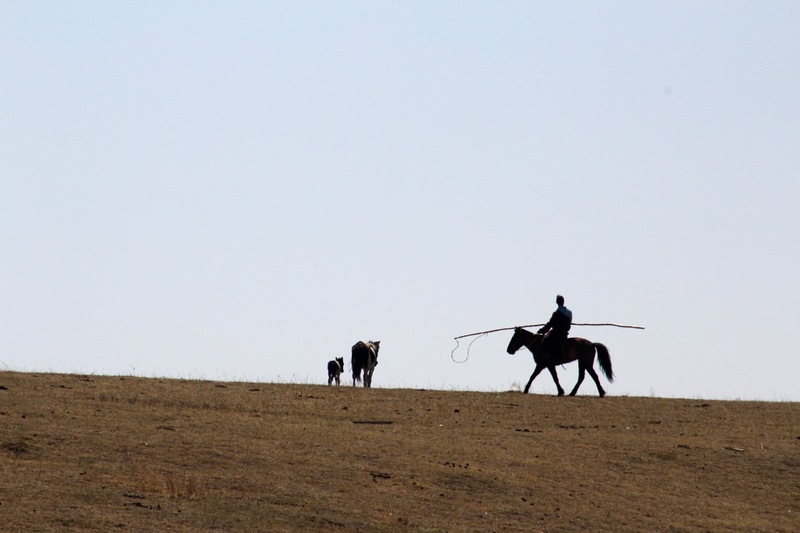 These are used by many Mongolian families, no matter how large, and you see them in towns or in the countryside. They are completely round with a peaked roof, out of which goes the stove pipe. Some light comes in at the top, but there are no other windows. The style or color outside (off-white) does not seem to vary very much from place to place. While the outside is plain, the inside is quite colorful with painted wooden spokes that hold up the ger fabric and colorful painted furniture. That night we had dinner in the central facility, and they stoked up my fire. The wood stove is necessary because it gets very cold at night. When the fire is going, it is very warm in the ger, and when it is not going, it gets very cold after sunset. Luckily, I had packed my “cat burgler suit” (so named by my friend, Sue Dodds, because it is tight fitting and solid black). Purchased it some time ago at REI for a sailing trip in the Puget Sound, this hooded fleece garment always warms me up, and luckily I had packed it for this very occasion. I put it on after supper and was never really cold afterwards. When it got dark at 10:30 my guide took me stargazing up the hill. It was amazing to see the stars and Milky Way slowly appear in the vast Mongolian sky. Afterwards, with my warm clothes and four blankets, I stoked up the fire and slept like a baby. After a great breakfast with Baggi and the Swedish couple, we set off walking across the nearby hills. We stopped at the home of a nomadic family (prearranged, I’m sure) for another breakfast with traditional food, including Mogolian tea (which is drunk with salt and not sugar) and dried goat cheese (which has a very savory—almost bitter—taste). Their ger was similar to the one I slept in but houses a family of five, with beautifully painted furniture inside. It also had the father’s medals from horse riding contests hung around on display. We took a fairly strenuous walk up into the hills, where we saw a tree with prayer flags. Apparently this is a place where shamans come to offer prayers. 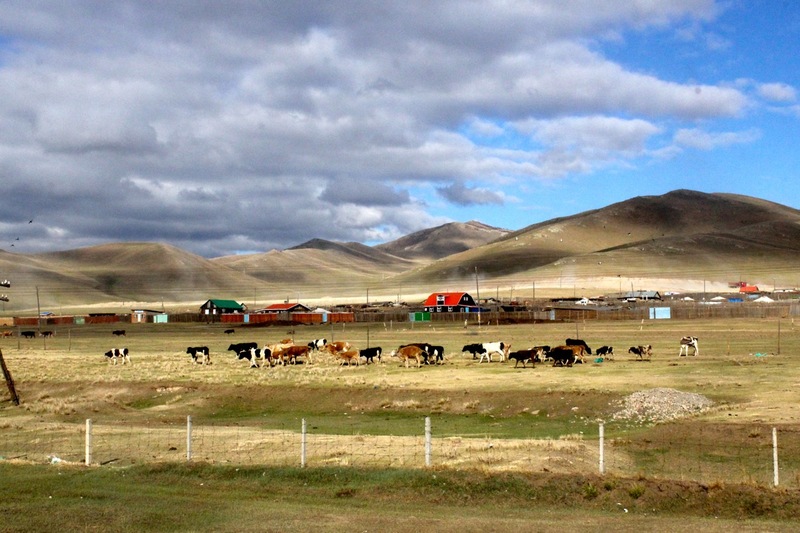 Baggi is concerned about environmental issues, including one that is uniquely Mongolian. They used to have prayer flags made of silk which typically lasted only a couple of years. Now the prayer flags are made of plastic, and they never go away, a situation which apparently kills the trees. Baggi is interested in birds, and we saw some on the walk, which he identified for me. It was interesting to see the magpies in their large nests. After this we hiked down to the paved road where we were picked up by the bus with the rest of the group, who had driven out from town for the afternoon. I was able to tell them (trying not to gloat) what an amazing experience they missed! 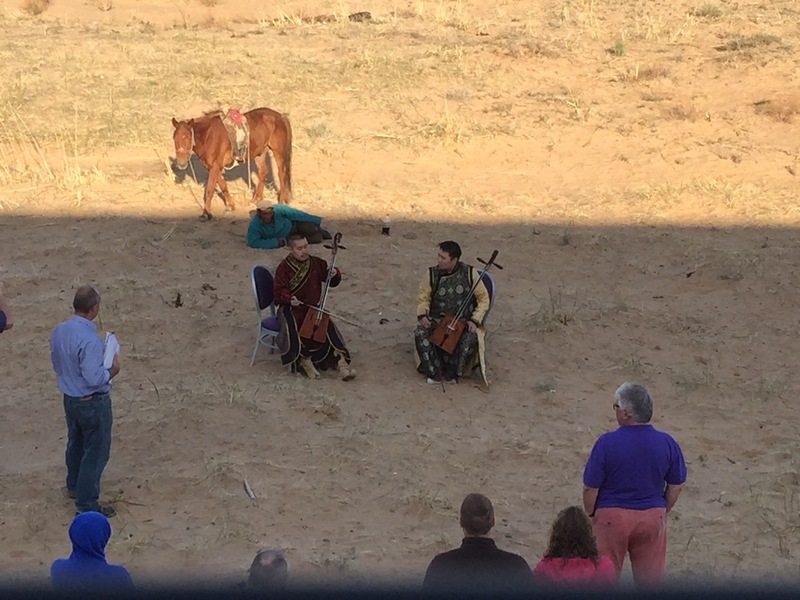 In the afternoon we had a “typical” outdoor Mongolian barbecue, and then saw a nice show including two amazing musicians singing and playing on traditional Mongolian stringed instruments. One of the men sang in the traditional style called throat siging, which is difficult to describe. It is wordless for the most part. He sings both extremely low (sounding like a bass fiddle) and extremely high, sounding like a bird or a flute. Then we saw some traditional Mongolian wrestling, archery, and horse racing. 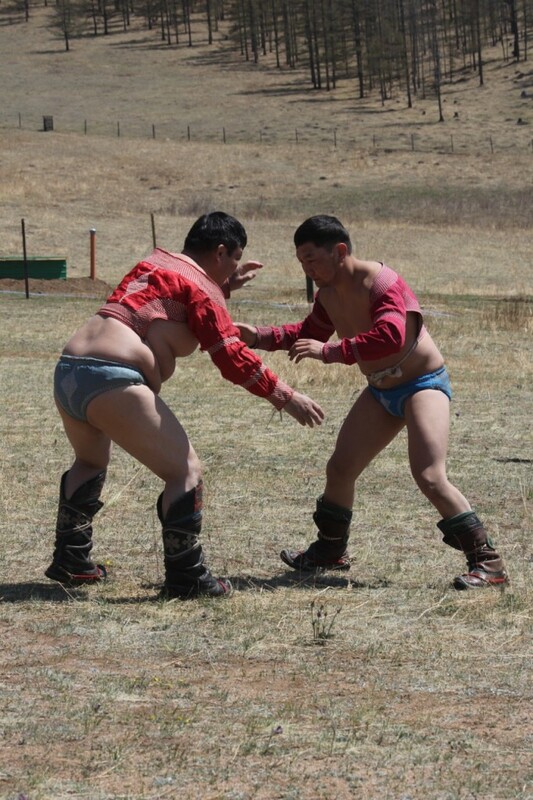 Mongolian racing resembles sumo Japanese wrestling; all ages and weights wrestle against each other, and there are almost no rules. The archers are both male and female. The horseback riders are old and young. These are the three big Mongolian sports, and there is a huge national competition in each sport every July. We went back to town and again boarded the train headed for the border, sleeping on our Russian train one last time. Early the next morning we awoke in the Gobi Desert. It is a vast expanse of brown/beige sand, with some minimal foliage, somewhat like parts of Arizona. Astonished, I looked out the window and saw what I thought was a herd of horses, which turned out to be a herd of camels running very fast, herded by a rider on horseback. Then the train stopped and the camels and rider came up near to the train. Hans (our tour leader, the “big boss,” a very nice and out-going German, who speaks multiple languages fluently, including Chinese) had apparently arranged for this touristic “photo-op” stop. 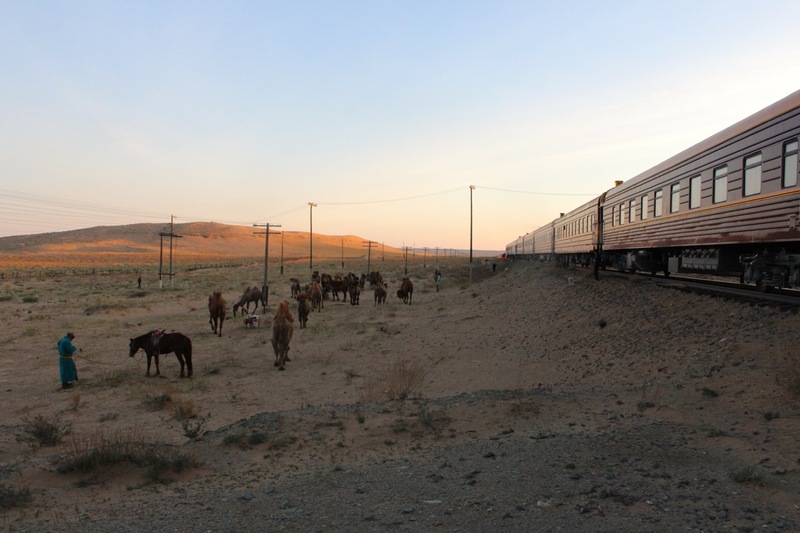 So most of us got off and put our feet down in the gobi Desert, which was actually pretty fun, if a bit surreal, even more so when the Mongolian musicians who had entertained us the night before hopped off the train and began playing and singing in the Gobi Desert surrounded by camels. You wondered what those camels and their herder thought of these strange Europeans and Americans and all of their elaborate cameras. From the look of the camels, who were milling around and munching the occasional bit of desert grass, it looked like they felt it was all in a day’s work. The herder himself seemed rather amused (especially since he was going to be paid an unknown sum). He came right up, lay down, and listened attentively to the music, while his camels started roaming out into the desert. No problem. When the concert was over and it was time for the train to leave, he hopped on his horse, rounded up the camels easily, and headed off across the desert. We are now more than 3,000 miles from our origin in Moscow–five time zones and one full week on our train, which frankly seems like at least a month. Time blends together at this point. It could be a day; it could be an eternity. It is now almost nine o’clock, and though the sun set almost an hour ago, there is a glow of red over the mountains. The last three or four hours of travel have been the most beautiful. Were it not for the clusters of weathered wood houses, you would think we were in Montana: towering blue mountains and vast plains with occasional herds of cattle. 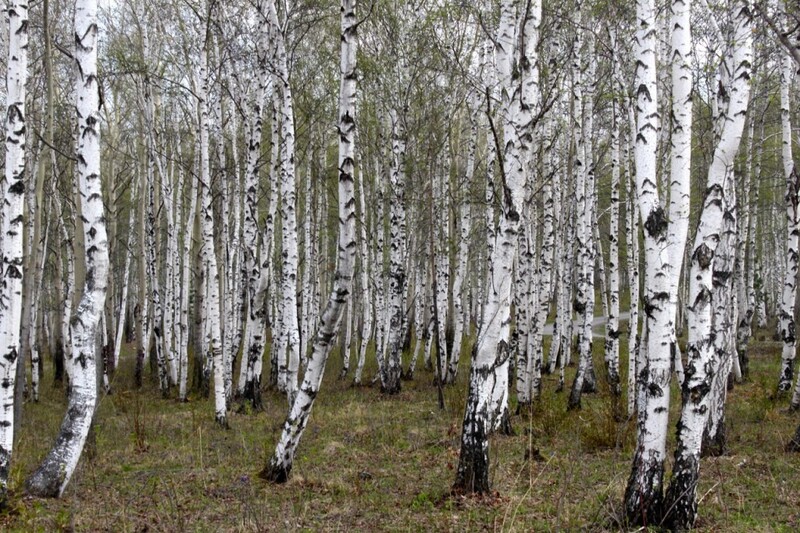 It is not that I dislike birches and huge conifers, which were the staple before we arrived in Ulan Ede. Every landscape we have seen so far has been beautiful. The steppes, however, are something special. We have climbed several thousand feet since we left Ulan Ede and still have more to go. So the question of the day is this: what is it like to travel 3,000 miles with 16 people you had never met, only three of whom are Americans. Well, if you are lucky, you make new friends. Let me tell you about Embry’s and my new best friends. Our best friends are the young Italian couple who are on their honeymoon. He is a dental assistant, and she works for a company that makes gifts for hotels. They are smart, articulate and Pierre-Antonio is an avid NBA fan. He played point guard when he was in high school and college and knows far more about U.S. basketball players than I do. Our best friends are also two English ladies about our age, who have travelled together many times. Both are retired school teachers in the UK. 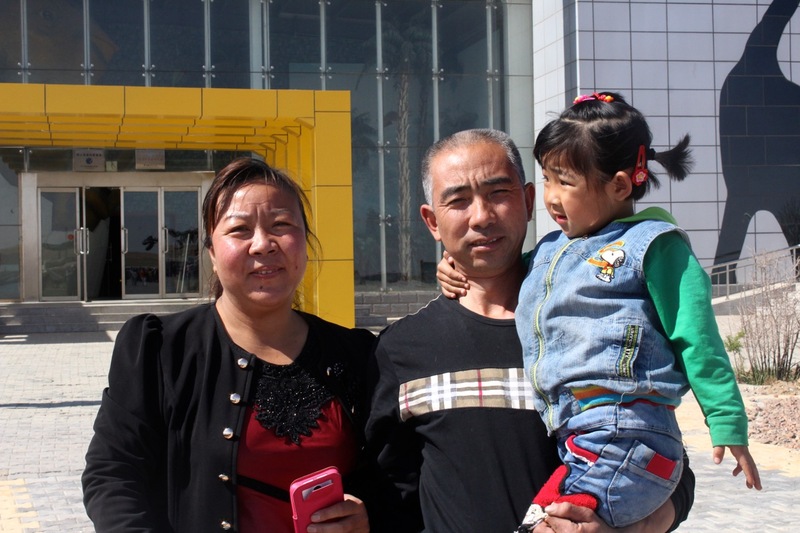 Jean’s husband is disabled and does not travel, and Sandra is a widow. They are they are energetic and adventuresome. There is nothing they won’t do, including dipping (their feet) in Lake Baikal, and their enthusiasm is contagious. Our best friends also include Pat and Chris from Ireland. Both are in their fifties. Chris is a retired nurse, and Pat is the retired CEO of the Irish subsidiary of a major multinational service company. Chris says Pat may be “between careers” since he retired mainly for health-related reasons and is doing fine now. They are both sharp, savvy and sophisticated. Chris won the limerick contest this week hands down. Our best friends are also the Spanish couple, a fifty-something mother and her twenty-something daughter. She does not speak English very well but her daughter does, and both are fun loving and always upbeat. Our best friends certainly must include the four wild and crazy, middle-aged Israeli guys, who mostly don’t speak English but who dutifully try to take in what our guides are saying even if they do not understand it. Embry got into a heated discussion with one of them last night, who is a big Netanyahu fan and more or less held her own. Two of the group are world class cruising sailors, having sailed around the world together. Our best friends are Joyce and Chris. They are not a couple but rather two singles, traveling independently, never having met before this trip. Chris, a Brit in his early sixties, is happily married, but his wife does not accompany him on many of his nostalgic train journeys. His wife still runs the marketing firm they started in England. He likes to say, “She makes the money, I spend it.” Joyce, an American a little younger than me, is an international development consultant, having worked for the Gates Foundation on issues related to finance in emerging nations. She is a Mennonite, and it turns out we have some friends in common from my retirement housing days when I had Mennonite clients. She climbed Mount Kilimanjaro last year. Chris, as they say, is a piece of work. The best description of Chris is that he is a lovable teddy bear. The only thing he would rather do than buy drinks for a half dozen people is to buy drinks for a dozen. He has not seen anything in Russia he couldn’t find interesting or say something nice about. Our best friends are also Teri and Robert. Teri is probably about ten years younger than her husband, Robert, who is 61. She is a retired teacher/trainer for IMB and a very smart techy. When I first met Robert, I thought he was a bit strange, and then on day two or three he suddenly appeared at our open compartment door and said, “The thing about people like me who have Asperger’s is that we want to be your friend but don’t know how.” Suddenly a light went on. From then on Robert became my best friend. We share a love for sports, but unlike him I can’t remember the score of virtually every game ever played in US professional sports, and I do not immediately know the square root of any number you might dream up. And finally there is Katya, our thirty-something guide, who is, quite simply, the best in the business and everyone’s best friend. So you what do we have in common? 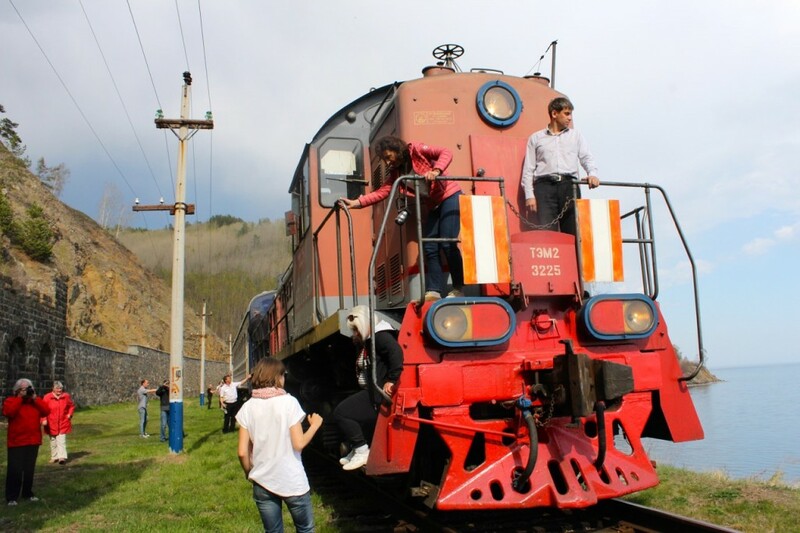 It takes a certain kind of person to take the Trans Siberian Railroad, and the threads that seem to tie us together are a sense of adventure, curiosity, a good deal of previous traveling experience, perhaps a small dose of hedonism, a lot of patience, and enthusiasm for life. Frankly, I have found our traveling companions to be inspiring. I have not heard a whimper or a complaint. Our new “best friends” all seem to respect the various cultures we are experiencing and appreciate what they see, eat, and drink regardless of whether they really like it or not. When asked about whether we are a “good” group or not, our guide, Katya, replied, “You or not a good group, you are a marvelous one.” I agree. Our English speaking contingent of the Siberian tour has been one of the most pleasant surprises of the Big Trip so far. But it is not just us English speakers. 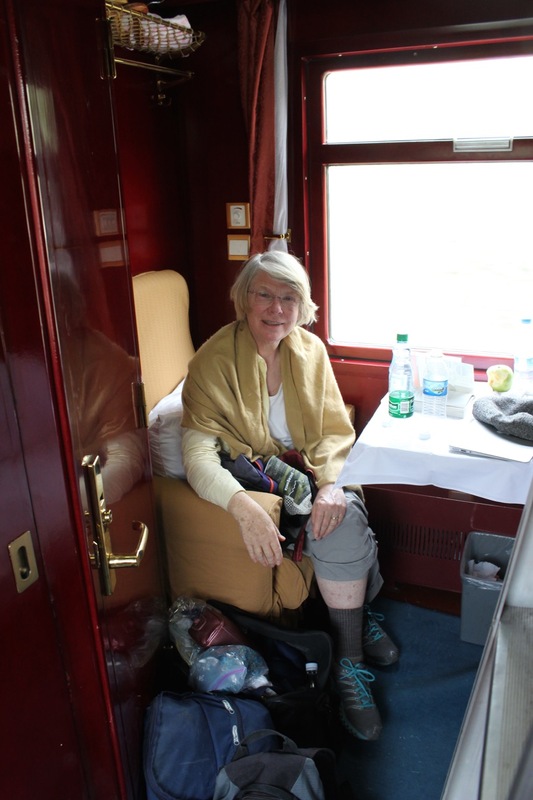 The German and French speaking groups seem to be enjoying the experience as much as we are, and dinner gatherings in the dining car are chatter and laughter-filled with plenty of wine flowing alongside the delicious food. The dinner before last bordered on being out of control with live music by a wandering accordion player, lots of wild laughter, followed by boisterous singing and then dancing in the isles—all facilitated by the 16 bottles of champagne that Chris had purchased throughout the evening to share with everyone. Before the evening wound down around midnight, Germans, French, Spanish, Americans, Brits, and Russians were kissing, hugging and embracing each other like they were all first cousins at a family wedding. And just think, at one time or another our respective countries have been mortal enemies. The most touching moment for me came when several middle aged German men embraced and kissed the four Israelis, any one of whom could easily have lost a relative in the Holocaust. You can only shake your head and wonder why we humans can’t hug and embrace all the time, not just on trains chugging across the isolated and lonely steppes of Central Asia in the middle of the night. 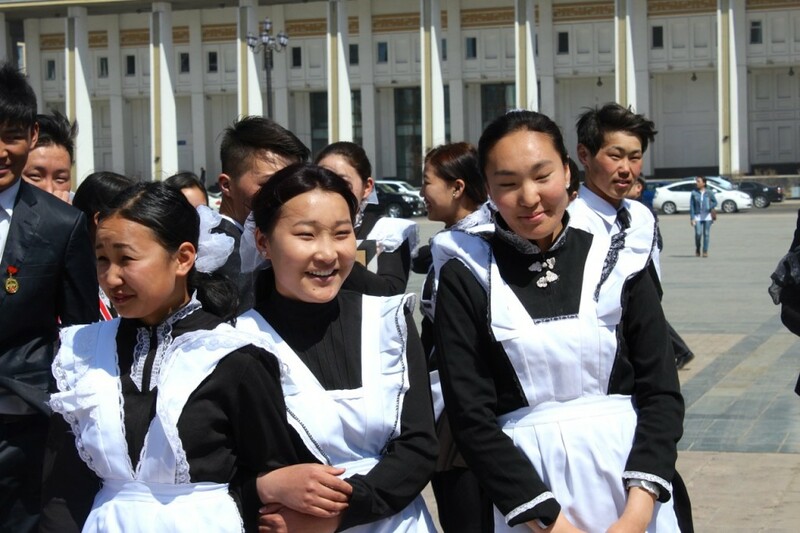 We have just completed a day in Ulan Ude, the capital of the region of Burjatia, which is where most of the Mongolian people in Russia live and for this reason has a strong Asian influence and feel to it. It seems a bit poorer and ragged around the edges, however, but still is a vibrant city of around 500,000. 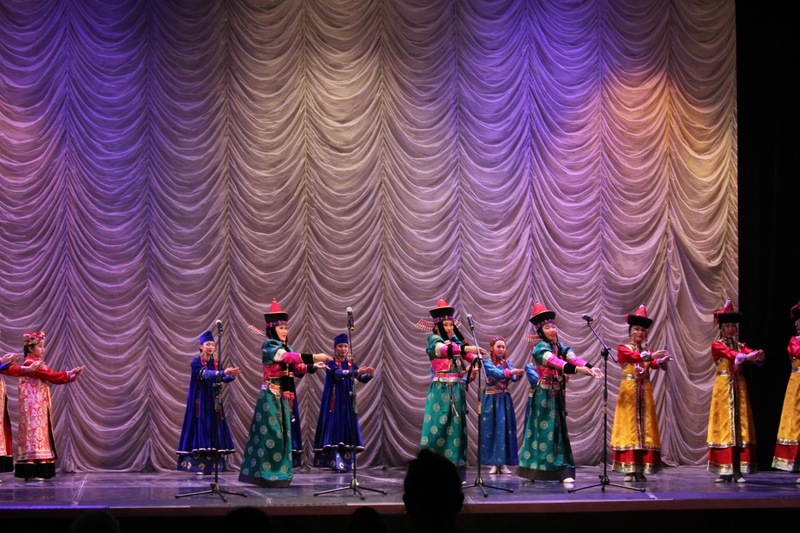 We enjoyed seeing a very impressive folk concert featuring both Asian dances, Russian Cossack songs (featuring “throat singing”) and music on a primitive stringed instrument. We also attended a Russian Orthodox church where a service was in progress—packed house (all standing, diverse ages) and enough chanting, singing (excellent choir), incense, bells and whistles and regalia to put our High-Church-Lite All Souls Episcopal Church in DC to shame. Embry got to see this, not me, and said it was one of the most remarkable experiences of the trip so far. I would simply add that having a service like this in Russian rather than English is a strong satisfaction enhancer. Later we visited a Buddhist temple, also with a service in progress presided over by six monks in red robes, chanting prayers to another full house, this time all Asian looking. Lunch was in an upscale 11-story hotel on the top floor with a revolving restaurant, another example of the many contradictions in this ethnically diverse and incongruous country. The journey from Irkutsk to Ulan Ude was memorable for several reasons. First we traveled by bus from our hotel respite night in Irkutsk (Courtyard Marriott, lousy food) along the Angara River (the only river flowing out of Lake Baikal) stopping along the way to visit an outdoor museum consisting of old, wooden buildings created by the pioneers and settlers of Siberia. What became apparent during this visit is how the US and Russia both share a frontier heritage. The settling and conquest of this vast area happened about the same time that the West in the US was settled. The houses looked remarkably similar to the cabins built by settlers in the US, and the primitive implements like plows, millstones and rough hewn furniture also looked the same. Our local guide talked about the bad rap Siberia has gotten over the years for being known only for its cold and inhospitable winters and for its gulags. While the winters are cold and the summers hot, the area is extraordinarily beautiful with its snow capped mountains, vast planes, wild rivers and deep and endless forest, “the Taiga.” Most important, she said, was that the use of the area for political exile came rather late in its development, and for a long time it was the only region in Russia that was “truly free.” Serfdom was never permitted in any of Siberia, and until the political exiles began happening under Czar Nicolas I in the early 1800s, the people attracted were mostly independent, hard working and industrious. Many of the early settlers became trappers, traders, hunters and farmers, and some became wealthy. The indigenous nomadic population, the Buryaits, were largely ignored or pushed aside. In contrast to European Russia, however, it was largely a classless society. While the czars sent dissenters here, it was not until the Soviet period—from 1920- 1952 being the worst– that the word gulag and Siberia became synonymous. Reportedly over two million in work camps at any given time and almost twenty million political exiles in all. The wild West frontier in the US has shaped our character and our values as much as just about anything, and I suspect that may also be true of Russia. Our guide told us that of all the groups she takes on tours of Russia, the US tourists are far more like the Russians than any of the Europeans. She says we tend to have a similar sense of humor and to relate to people in similar ways. Perhaps the two frontiers—the West for us and the East for Russians—has played a role in this. Another similarity is that Russia had serfs and we had slavery. Both institutions were terminated in the 1860s and left legacies both countries are still dealing with. 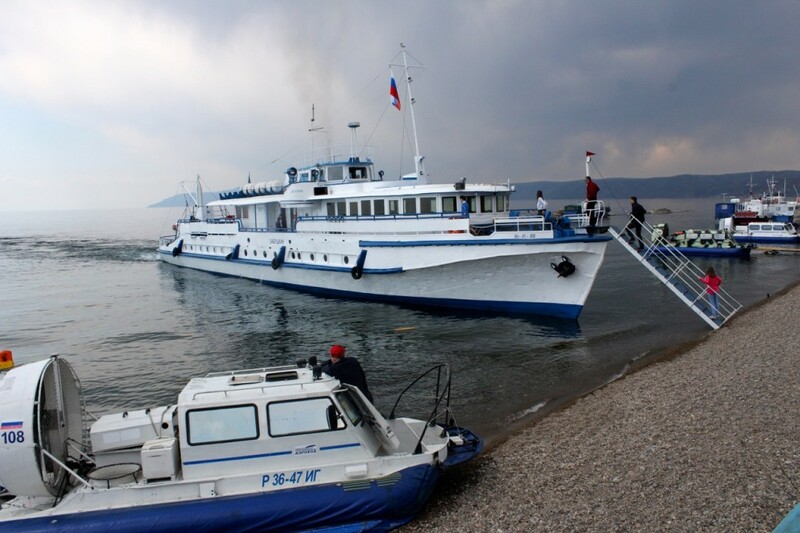 The second reason that the journey was special was Lake Baikal. This lake contains more fresh water than any other lake in the world, about 20% of all the fresh water on the planet. It is several hundred miles long, on average about 40 miles wide and about a mile deep. There are hundreds of species not found anywhere else on the planet including the world’s only fresh water seal. Over 35 million years old, it is by far the oldest lake in the world and is still widening albeit slowly, several centimeters a year. The day was warm and partly sunny but also fairly hazy so you could barely make out the towering snow capped peaks on the eastern side. After visiting the local market, we said goodbye to our bus and boarded a ferry, which in 45 minutes deposited us on the eastern shore at a small and somewhat decrepit port. The lake was calm and the ride uneventful. At the port we boarded our train again and set off on an old and partially abandoned railroad track alongside the lake. Of course, many may recall that we were in the Lake Baikal area in the summer of 1993 when Andrew and his Russian friends at “Friends Travel” arranged a tour for us and a group of our friends to the remote Lake Baikal Nature Preserve, a pristine forest very close to where our ferry landed. That trip was as different in accommodations and tourism style as you can get but also just as much fun as this one and still ranks highest on my list of great adventures. But that was then and this is now. We are 22 years older and the world has changed. Russia has made progress but is still struggling through the privatization period and is now flexing its muscle in new directions, which leaves the West—and most of the Russians we have talked to– perplexed and anxious, not knowing where it is all headed. On the famous Great Siberian Odyssey of 1993, we forged flooded streams on makeshift bridges of fallen trees and ended up getting out of Siberia by flagging down a converted troop carrier and paying them to drive us over 100 miles to Irkutsk (since rail road bridges had been washed out). On this trip those who wanted (which included me) were invited to board the locomotive engine and ride in open air alongside the lake, gripping the safety rail like mad. We were supposed to stop for a picnic, but because of rain had to settle for a stop to allow brave passengers to take a dip in the 40 degree water of the lake. Out of close to 100 people, twelve people took the plunge. Most were Germans but our Robert was the only American. More on Robert –and other members of our tour group–to follow in the next blog.